I wasn’t sure if I was going to read this novella as it didn’t see to be relevant to the story. Then I couldn’t decide if I should read it before or after I read Unravel Me and Ignite Me. I decided to finish the story first and then go back and read this novella from Warner’s perspective. First off I have to say OMG I loved reading from Warner’s POV! I loved getting to see his side of the story and have insight into what made him tick. I’m actually glad I waited to read it because I think it would have ruined the series for me to read it first. I liked knowing only what Juliette knew making me understand her decisions and actions all the more. This was totally worth the read if you are a fan of the series. I’ve always had a soft spot for Warner so it was a real treat reading this. I’m going to go read Fracture me now and see Adam’s side of the story. 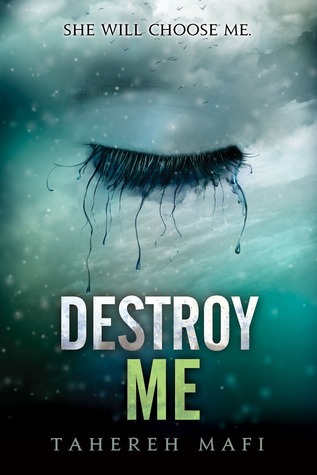 This entry was posted in Reviews and tagged 5), Cynthia Stacey, Destroy Me (Shatter Me 1, Tahereh Mafi. Bookmark the permalink. Oooh….sounds good! The human will love that book..(if she can get me off it when she gets it. (*I love a good book fur napping on*)…. But I’ll have to move off the pages…. (*there’s always a catch*)!